Institute of Management Technology (IMT), Nagpur hosted Voyage- The Start-up Internship Fair, on 2nd and 3rd December 2017. The event was organised by ‘Kushagra’- The Entrepreneurship Cell, in association with the Placement Committee of the Institute. 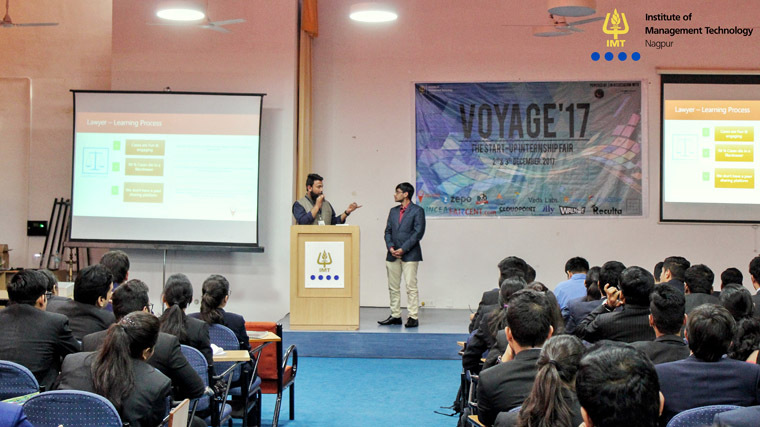 This year, fifteen start-ups from across the country participated in Voyage. Dr Rajiv Joshi, Chairman of ‘Kushagra’ and Dr Pawan Jain, Chairman of Placement Committee inaugurated the event by lighting the lamp. This was followed by the Power Talks, in which founders of each company addressed the student managers and gave them a brief introduction of their organisation, their journey and vision. On the first day, the following start-ups participated in the recruitment process- Autogram, Click2Clinic, Cloudpoint, Don’t Scratch Your Head, Faircent, Reculta and Walnut. The companies selected the student managers on the basis of their performance in the processes. The day ended with Zimfonia- the music forum organising a bonfire and karaoke night, wherein the student managers had the opportunity to interact with the founders of different start-ups. The second day began with the briefing and selection of the following companies- Advok8, Black Cab, Evincea Consultancy, FinMomenta, Naaniz Seller Services, Olly Credit, Veda Labs and Zepo Technologies Pvt. Ltd. The recruiters were satisfied with the overall performance of the student managers and applauded the well-organised event. Thus, Voyage concluded on a successful note and several student managers were placed for summer internships with these fast-growing start-ups.